Lithuanian American National Council, Madison Square Garden, New York, March 13-14, 1918. A frequently overlooked historic fact is that Lithuania’s Declaration of Independence of February 16th, 1918, did not occur overnight. It was, instead, the consequence of a series of significant events and political developments. This, of course, does not detract from the achievement which the declaration’s signatories brought about. However, it must be remembered that there were many others involved in the struggle for independence including many Lithuanian Americans who energetically joined in and effectively contributed to this campaign. Lithuanian American National Council, delegate pin Whitehead Hoag, New Jersey. It is generally agreed that the Lithuanian National Awakening of the late 19th century and the resultant Lithuanian Independence movement stemmed from the Polish-Lithuanian Insurrection of 1863-1864. While that struggle did not succeed, it energized the nation to continue its efforts to free itself from Czarist rule. The consequent brutal suppression of this insurrection led to an even greater resolve to resist tyranny. The Russian regime outlawed the publishing of books in the Lithuanian script; they had to be printed in Russian cyrillic type. At the same time, industrialization of the urban areas and the transformation of the agricultural sector were taking place across the Western world. In Lithuania, like most other countries, the resulting economic turmoil led to the departure of one-fourth of the Lithuanian nation. Emigrants sought a better life overseas, mostly in America. One would think that the loss of a quarter of the country’s population, in one generation, would have a devastating demographic effect. Actually, this flight not only enabled the nation to survive but eventually contributed significantly to achieving its long-sought independence. The Book Smuggler by Juozas Zikaras, Kaunas,1928. While Lithuanian American immigrants embraced the liberty and riches offered by the new world, they did not forget their homeland and the families they left behind. 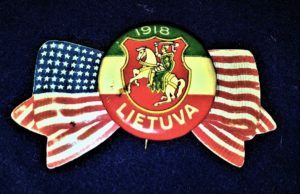 It is suggested that the Lithuanian National Awakening would not have been successful had it not been for the participation and financial contribution made by thousands of Lithuanian Americans and their organizations. Lithuanians on both sides of the ocean were directly involved in preserving and drawing inspiration from the nation’s glorious past. There were many outstanding leaders and writers in Lithuania. At the time, however, they did not have at their disposal the economic resources necessary to pursue this struggle. Publishing was controlled by the Russian government and the printing in the Lithuanian language essentially prohibited. As a result, printing of Lithuanian publications took place in neighboring East Prussia (also known as Lithuania Minor). A clandestine network of book smuggling was established to deliver these books into the hands of the Lithuanian people. This was a perilous undertaking requiring courage and an ability to outmaneuver the Russian border guards. Surreptitious funding of this effort was received from American Lithuanians and their organizations. In many ways, it was the Lithuanian American funding of the nation’s book smuggling effort that kept the flame of the Lithuanian independence alive. Without the support of Lithuanian Americans through their writings, political action, and financial aid, the Book Smuggling Movement would have failed and with it the hope of independence. It was these enthusiastic and perhaps sometimes impatient Lithuanian Americans, who reveled in all things Lithuanian, who were the first (in 1917) to declare Lithuania’s Independence — complete Lithuanian political sovereignty a year before it was declared in Lithuania! Fifty dollar Lithuanian Liberty Loan Certificate, 1920. The Lithuanian independence movement only gradually evolved in the homeland. Initially, the leaders of the movement merely sought some modicum of political autonomy, some accommodation within the framework of Czarist Russian Empire. In 1905 the Russians were routed in the ill-fated Russo-Japanese War. This resulted in an easing of the Lithuanian publication restriction. With the advent of World War I and the ensuing occupation of Lithuania by German forces in 1914, the Lithuanian independence movement considered the option of a Lithuanian kingdom within the framework of the Imperial German Empire. As part of this effort, some Lithuanian leaders even offered a crown to a proposed new Lithuanian monarch, a member of the Wittenberg dynasty who claimed a remote lineage to the Lithuanian King Mindaugas. He would have been known as King Mindaugas II. 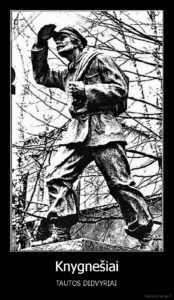 Were the Lithuanian political leaders being opportunistic or were they just being practical given the conditions they faced at the time? In any event, this proposal did not pan out and was soon abandoned. Postcard, Lithuanian Roman Catholic Federation of America, c. 1910. 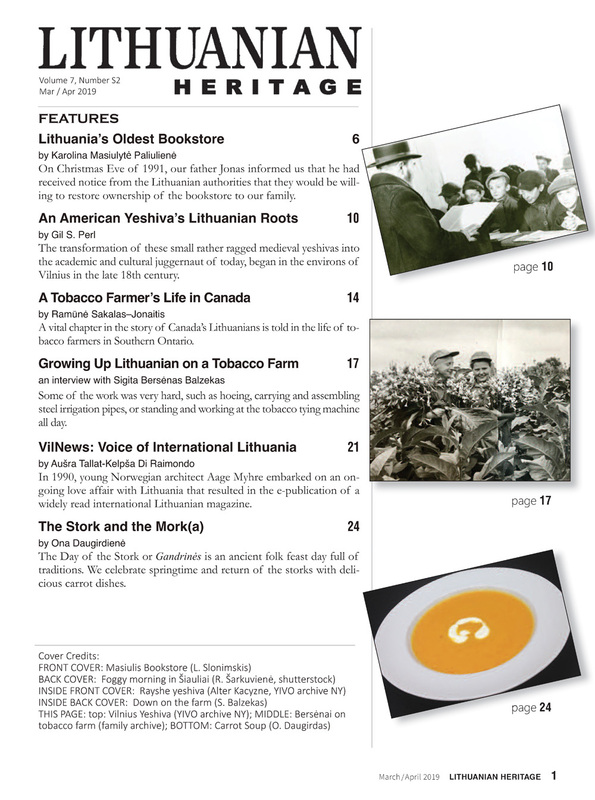 Let us now recount the Lithuanian Independence Movement from a Lithuanian American perspective. The Lithuanian Americans were also experiencing their very own version of a Lithuanian Awakening and their patriotic organizations gradually developed over the years into nationwide networks. Following the first attempt at Lithuanian autonomy at the Great Vilnius Seimas in November 1905 Lithuanian Americans held their own, First Lithuanian American Political Convention, in Philadelphia, Pennsylvania, on February 22, 1906. There they demanded Lithuanian political autonomy. 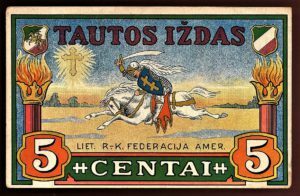 By 1908, the many smaller local Lithuanian community patriot organizations joined together to form the National Society of Lithuanian Patriots, which began funding Lithuanian publications and supported various activities promoting Lithuanian independence. 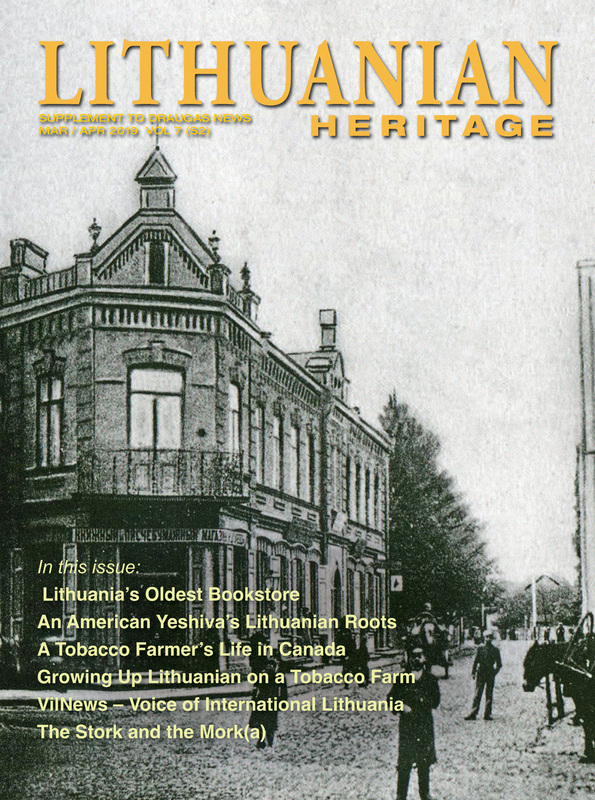 The Lithuanian language publications and articles penned by Lithuanian Americans were sent to Prussia along with funds to support the Lithuanian book smuggling movement. As World War I raged in Europe, Lithuanian American, especially, Catholic organizations across the country raised money for Lithuanian War Victims Relief, which under a U.S. government system was disseminated to all war victims of the Czarist Russian Empire. As a result, these funds only helped those Lithuanians who had fled their homeland during the war and resettled in Russia. Finally, the Lithuanian Roman Catholic Federation of America, called a special conference on January 10-11, 1917, in Pittsburg, Pennsylvania, to discuss Lithuanian Independence. The coordination of efforts promoting Lithuania’s freedom was undertaken by the Lithuanian National Council of America which in Lithuanian was known as Amerikos Lietuvių Taryba, a precursor to the Lithuanian American Council (LAC) which continues to operate to this date. 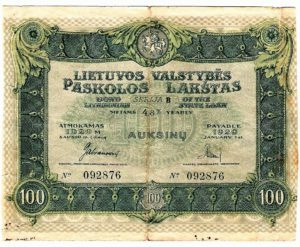 Lithuanian State Bond 100 Auksiniai, 1919. In accordance with the Lithuanian National Council of America, the Reverend Jonas Zilius and Dr. Julius Bielskis were to present copies of this Lithuanian Independence Declaration to President Woodrow Wilson and the representative of the Vatican and other foreign ambassadors in Washington, D.C. This was done a full year before independence was called for in Lithuania. Also, through Dr. Bielskis’ efforts, a Lithuanian Information Bureau was established in Washington, D.C., which was commissioned to inform American political leadership, the media and the public at large that the conference has passed a Lithuanian Declaration of Independence. (Today the Lithuanian Information Bureau’s work continues to be performed by the Lithuanian American Council through its agency Joint Baltic American National Committee in Washington, DC). Although these Lithuanian Americans had been the first to proclaim Lithuanian Independence, they fully realized that a national government has to exist in Lithuania for the nation to be genuinely free and independent. As a result, when a subsequent Lithuanian Declaration of Independence was passed on February 16th, 1918, in Vilnius, they immediately recognized and supported the newly established government. 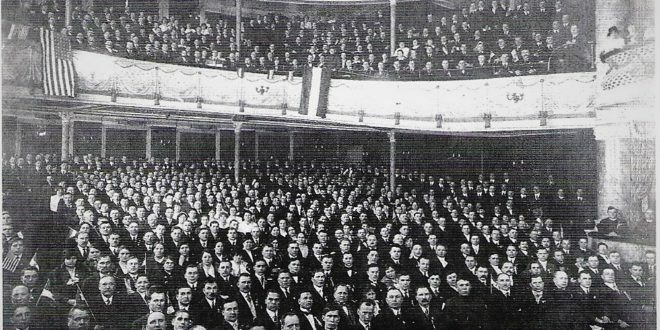 The Third National Congress of Lithuanian Americans was held on March 13, 1918, at Madison Square Garden, New York, wherein both Catholic and national political leaders representing over 700,000 of their countrymen jointly called for the U.S. to recognize the Vilnius declaration and the government formed under it. This resolution was forwarded to President Wilson and other foreign representatives. Although President Wilson delayed recognition of Lithuanian independence and the new government, he authorized the Lithuanian American representatives to attend the anticipated Paris Peace Conference. As a result, Lithuanian American delegates were in attendance at the 1919 Versailles Peace Treaty Conference. Also, Lithuanian Americans substantially financed the Lithuanian government operations for several years through their purchase of Lithuanian loans and bonds. 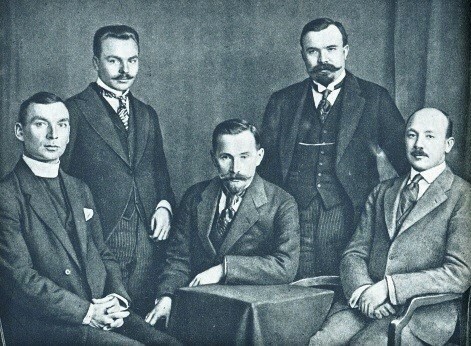 Several Lithuanian government officials at the time attested to the fact that the nascent Lithuanian government would not have survived but for that financial support. There is no question that Lithuanian Americans were directly involved in the Lithuanian Independence Movement and their support was crucial to the establishment of Lithuanian statehood in 1918. Henry Gaidis represents the Lithuanian American Council (LAC) in Washington and in such capacity serves as director of the Joint Baltic American National Committee (JBANC) which he chairs on a rotational basis. Lithuanian attendees at the Conference of Lausanne in Switzerland, 1918. From left: Rev. Juozas Dabužis, Kazys Pakštas, Antanas Smetona, Martynas Yčas, and Balys Mastauskas (Frank Mast).